You all know that I don't change things all the time. I'm more of a get it the way I like it and leave it for a long time kind of girl. First, I brought out my favorite summery print that I've had for 2 or 3 years. I always look forward to putting this out because the colors are so pretty and make me happy. Besides who doesn't love the farmers market? metal on the lantern. I think it works and that pop of blue color is amazing. Thank you for always being an inspiration to me girls. You are decorating geniuses and I enjoy hanging with you. Love the blue bottle with wiring, so cool! The summer print is pretty too! Enjoy your weekend! I love how you pulled the colors of the Farmers Market print with your accents on either side. Just the right amount of "pretties" with some space for the eyes to rest--perfect! The picture is beautiful and I love the jar. As soon as you walk into the room....bam......your attention just jumps to that book. I adore that print! And the blue from the bottle does pop. Stacey, I just posted about changing things around.....again! Ha. Your mantel is so fresh looking....just the perfect colors. Pretty summery mantel! Looks great! I am a more frequent shopper at Home Goods these days! You can find the most interesting things! Your print is wonderful! Gone are the warm cozy fireplace moments! Your mantle looks just perfect for this time of year! It looks very pretty Stacey! 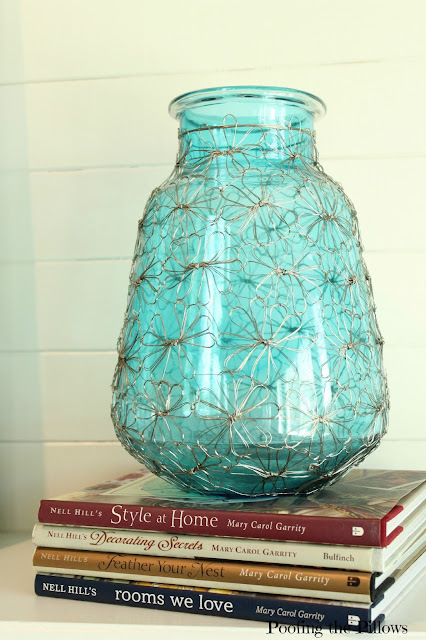 I love the color of that jar and yes, the wire is really neat!! Good shopping and I love your summer mantel! You do a pretty good job yourself Stacey! Very pretty and my favorite color! This is great, Stacey. I love the print and the stack of books. The first looked familiar, I have it, too. I'm so much the same way about arranging things. Once I hit on something I like I really hesitate to change it. We are so alike! Hi Stacey, love your mantel. Adding the blue bottle is perfect. Your decorating is always inspiring. Beautiful summer mantel! The Mantel looks awesome! Love the bottle you got from Home Goods. You gotta love Home Goods! Love the pretty summer feel to the mantel. I love that pretty bottle and it definitely gives your mantel a pop of color. 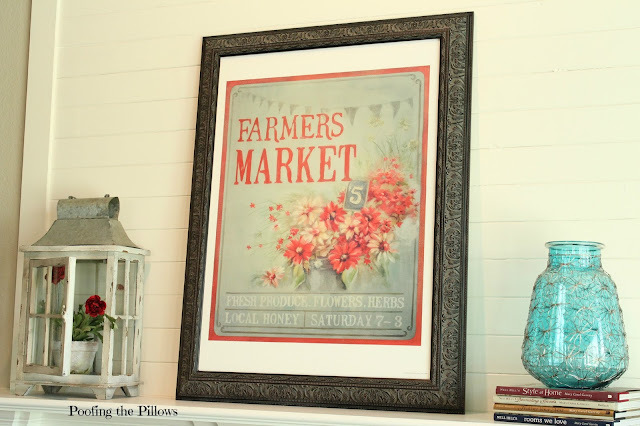 I was just at the Farmers Market yesterday and that fun print is perfect for summer. Well done. Very pretty. I love the print, the colors and theme would make me smile! Hi Stacey ~ My that's beautiful. take care friend. I am like you, I get things the way I want them and kinda leave them that way. Even at this new house, a lot of things are looking VERY similar to the last house, lol. Your summer mantel looks great. I love the bottle! Such a lovely mantel ... the colors are so soft and summery (is that word?). And, the wired blue bottle is perfect. Love it all! Aqua is always PERFECT! Love your little mantle display. So glad to hear your son is back to school. It takes perseverance and determination. Wonderful to see! I try to avoid Home Goods! I find so many things I want, but I really don't need anything more. I love a mantel with books! I love your summertime mantel...simple, such pretty colors, great mix of textures!! Stacey, you inspire all of US, too! Your print is refreshing and perfect for summer. The pop of blue glass is the perfect addition to your summertime mantel. What a beautiful blue vase! The wired design is so unique, Stacey.